A family on vacation near Santa Cruz are attacked by their doppelgangers who look to forever sever their unseen connection. "Us" is the second feature film from writer/director Jordon Peele, who put everyone on notice that he's just not a funny man with his socially poignant debut horror film, the Oscar-winning "Get Out." He offers up yet another horror flick in his sophomore effort. This story is focused on the Wilson family, Adelaide (Lupita Nyong'o), Gabe (Winston Duke), and their two children Zora (Shahadi Wright Joseph) and Jason (Evan Alex), who are on vacation near Santa Cruz. When Gabe suggests they head to the beach by the Santa Cruz boardwalk for a day of fun in the sun, it triggers a traumatic memory for Adelaide of a time when she got lost there and came face-to-face with another child who looked exactly like her but wasn't her. Despite her fears, she reluctantly agrees to go, and aside from one small incident, everything goes swimmingly. That night, however, a strange family shows up in the Wilsons' driveway who looks strangely like them but aren't quite them. The members of the Wilson clan are suddenly left fighting for their lives against their attacking doppelgangers who seek to replace them and take over their lives. 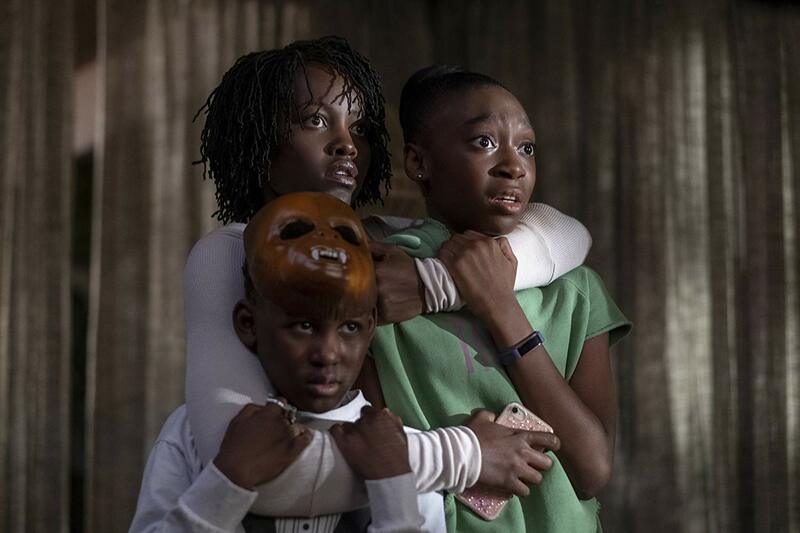 Jordan Peele is a filmmaker with a lot to say, and once again, he uses the horror genre to dabble in metaphor and social commentary. He preys on our preexisting fears to create an unsettling vision that's loaded with disturbing imagery, wonderful cinematography, and terrific acting. Lupita Nyong'o and the rest of the cast do double-duty as both themselves and their doubles, and Nyong'o especially deserves immense credit for her dual performances. She is so versatile and incredible, and she has created two completely different characters in Adelaide and Red, who are what drive the narrative to its ultimate conclusion. Some will not like this conclusion as it does leave a couple of unanswered questions as little is explained, though a heck of a lot can be inferred. Peele may have been a bit more interested in delivering his message than creating a plot-hole-free story. Or, maybe it's one of those films that is purposefully not explained to get people to look inward at their own behaviors and have a conversation about how they perceived the material because good lord, there is a lot to unpack here. Peele presents his vision in a way that will leave people talking for years to come about his actual intentions. *SPOILER ALERT* Here's what we think. "Us" is an interpretation of America (or the U.S., omg) itself. Even though we are separated by barriers that are difficult to overcome, we are still connected. 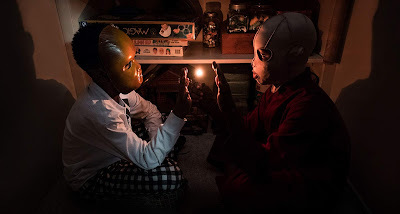 People are literally connected to their doppelgangers in the film, but in real life, that connection is much less apparent even though it's very much there. We think that part of Peele's point is that all that really separates us is environment, opportunity, and perception, the haves and the have nots, how the rich squander their opportunities and take what they have for granted, how the lower class are literally shoved to the bottom of the totem pole and into the recesses of people's minds and have to claw their way to the top, only to get smacked back down (just like they do in the game Whack-A-Mole). The material is thought-provoking in many ways. We have read about dozens of easter eggs and fan theories that give clues and might tie everything together, which makes us want to see it again. 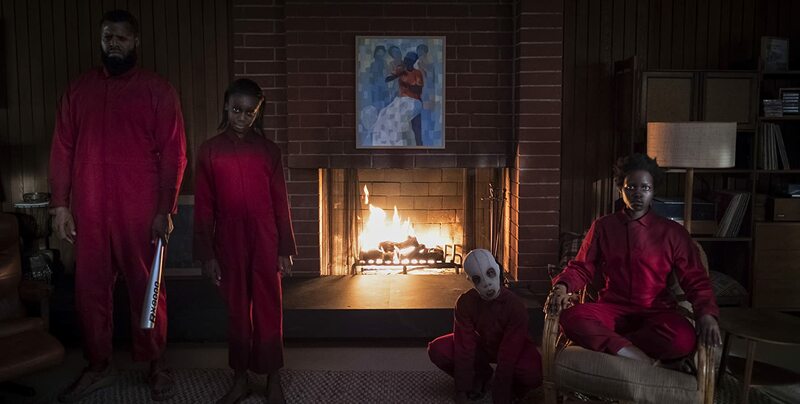 As far as being a cohesive piece of art and entertainment, "Us" is very good, but it does fall a bit short of Peele's previous offering. 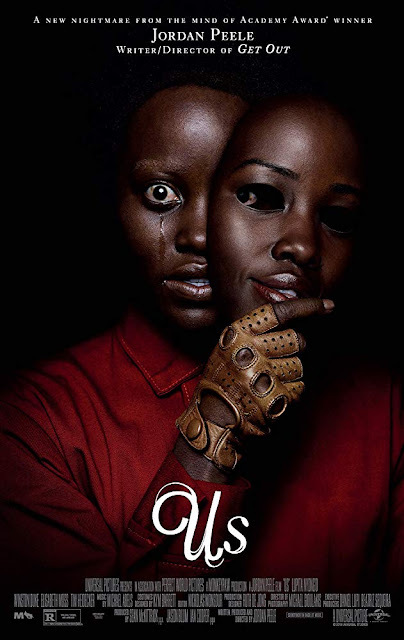 Overall, we enjoyed "Us" very much and think it is worth checking out so you can join in on the intricate discussion Jordan Peele has presented the world.